Explore all that Snapizzi can do for you. You signed up so that you could easily manage and post your images online, right? The next steps are going to show you exactly how Snapizzi will do that for you. We'd like to get you to the "AHA" moment as quickly as possible. So when you sign into Snapizzi for the first time, we'll create a Sample Project for you to explore. It will include a set of images for you to upload. You'll also experience the customer journey to their photos. We'll then guide you on how to set up your first Project. It'll take a few minutes to assemble the sample images once the Project is created. Once completed, we’ll email you the link to download the compressed folder of image files (96mb). 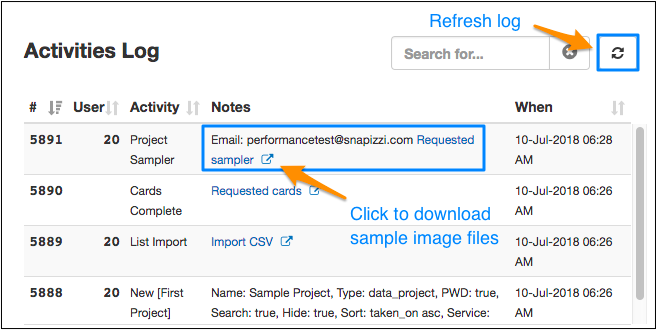 You'll also be able to find the download link in the Project Activity Log on your Snapizzi Dashboard. Subject and Group codes are photographed before taking their respective photos. All images following in the sequence will belong to the preceding code. Once we detect a new code, the process repeats. Group photos are automatically included in Subject galleries according to Project data. 3. Upload all 35 images contained in the folder to your Sample Project. 4. Once processing completes, open the Inspector to review the Project. 5. There’s complete information about the Inspector here. But for now, get a Subject name and password. We'll show you what your customers will see when using the your Studio Search Page. We'll use Lori Griffin for this example. Her password is ID 60132. 6. Your Studio Search Page domain can be found under the Wrench Menu > Studio Search. Your Studio Search Page will open in a new tab. 8. The next screen you’ll see will be your connected platform’s password gateway. Enter 60132. 9. Success! Your customer continues on to the ordering process on your platform. CSV Files: The heart of your Project. Create a Data Project: Apply what you've learned and start saving time! Snapizzi includes a robust set of tools and features that take the "work" out of your volume workflow. Interested in integrating your platform with Snapizzi? We should talk.